One of my recent purchases at the flea market in Vienna's Naschmarkt was a bound volume of Oesterreichische Woche, a weekly magazine full of pictures. The bound volume includes vol. 1, no. 1 (Sept. 1933) through vol 2, no. 53 (December 26, 1935). This volume covers a difficult period in Austria's history. One of the most chilling issues of the magazine is the one whose cover is shown in the picture on the left. It is titled, "The End of Social Democracy in Austria." The subtitle is "Chancellor Dr. Dollfuss inspects the defense action against the Social Democratic rebels." The issue contains the government's narrative of the brief civil war that took place in February 1934 in which Socialist Party resistance was routed and a one-party state was initiated. Englebert Dollfuss, the smallest guy in the picture, did not last long after the civil war. He was murdered in a coup attempt by Austrian Nazi on July 25, 1934. A monument commemorating his death is shown in the picture below. It was put up after his death, but removed by the Nazi regime. The monument was found in a storage room in the 1990s and is now in the Museum of Military History in Vienna. It is ironic that in destroying the Socialist Party, which consistently received a majority of votes in Vienna, Dollfuss lost an ally that could have assisted in resisting the efforts of the National Socialists to seize power. His nationalist fascist state was not nearly as severe as the the German Nazi state, but its creation weakened Austria, making it more vulnerable to a Nazi takeover. 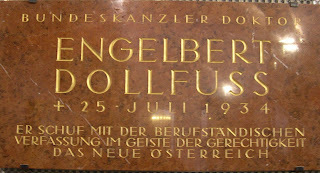 The words below Dollfuss' name in the monument say, "He created with the corporatist constitution, in the spirit of justice, the New Austria." While his supporters likely believed those words, a more accurate assessment of his legacy is this: he destroyed the Austrian Socialist Party and Austria's democracy, created a new authoritarian state, and paved the way for the creation of the Ostmark within Germany.